Driving south from Cairo’s deceptively modern airport, the chaos and poverty of Africa’s largest city is striking. The roads all have five cars per three unmarked lanes, all beeping at one another, all the time; children sit in the dirt and sand and litter that comprises the road’s edge, selling packets of tissues for 20 piastre (about 3c); derelict, smog-blackened buildings fill the skyline. The mythical Tahrir Square is, in fact, a large roundabout with some tents in the middle – home to the last vestiges of the revolution and some of Cairo’s homeless. When Mubarak was in power, my taxi driver told me, there may have been poverty but there wasn’t this degree of lawlessness. ‘I hate the revolution’, he said angrily. The heady moments of February 11, 2011, the date of Mubarak’s ousting, when it seemed as though the whole of Cairo celebrated in Tahrir Square, are certainly over. The united front of the revolution has fractured. The liberals, who were certainly the most visible revolutionaries, have become disillusioned after dismal parliamentary elections results and a burgeoning mutual resentment with the Scaf, Egypt’s supposedly temporary military government. There is a sense among this group that the revolution is unfinished. I spoke to a man whose brother had been murdered walking out of his house by a sniper, and he himself had been shot in the shoulder protesting in a street just off from Tahrir Square. He said that the subversive tactics, brutality, and the violent intolerance of dissent that characterised Mubarak’s iron hand were continuing under the Scaf. The ongoing imprisonments and police crackdowns on protestors, as well as plain-clothed policemen acting as provocateurs in otherwise peaceful protests, were proof, he argued, that ‘Mubarak is not out yet’. Conversely, there are also those who, in midst of the post-revolutionary chaos and a crippled economy, feel emboldened to express their dislike for the revolution from the start. An Egyptian lawyer, in one of the most surprising admissions I heard, pulled from his wallet a mug shot of Mubarak and confessed to me that he ‘loved’ the old dictator. For most, however, hope and happiness still reign. With good reason: although the process has not been as fast as many desired, the dismantling of Mubarak’s power structure that was built on crony capitalism and arbitrary brutality is occurring. In Luxor, the men who sail felucca boats for a living no longer have to pay the local policemen baksheesh money for protection. And even though they’ve seen profits falling precipitously as the tourism industry withers, the absence of fear and indignity has won their support for the protestors of Tahrir Square. There is also trust in the incoming government of the Muslim Brotherhood, even among Egypt’s small elite, a group not always inclined to cast their ballot for an openly, strongly religious party. A lecturer at Cairo University who I happened to sit next to on one of Cairo’s microbuses insisted that the Brotherhood was not intent on imposing Shari’ah on society, but rather would govern as Turkey’s AKP Party does, focussing on economic growth and a reduced role for the military in political affairs. It would be a ‘responsible’ government, he assured me. I’d like to agree with him, but one only has to look at the troubled history of newly minted democracies for reason to worry. While mature democracies are indeed more prone to peace and economic instability, the demands of populism and weak institutions have often led nascent democratic states towards war, financial instability and even collapse. Think of the former Yugoslavia under Milosevic, or Algeria in the early 1990s. With Egypt’s economy in free-fall, and no sign that foreign investors are going to stop running away from it, the Brotherhood government may be inclined to create distractions for a disaffected population. That will be when a woman without a headscarf may become an issue for parliament to debate, or relations with Israel take on a more decidedly adversarial tone. 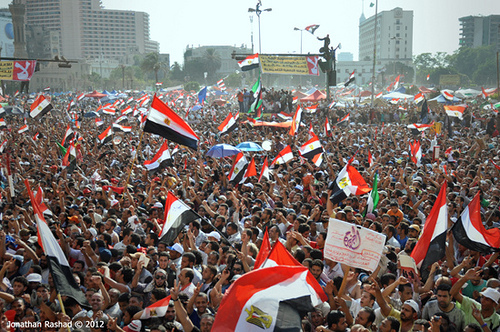 In the end, what continues to unite Egyptians is nationalism. Be quite sure: that was what brought Cairo’s citizens to Tahrir Square and gave them the courage to confront Mubarak’s sadistic state. It’s also what motivated people to talk to me, urging me to believe that a better Egypt would emerge in the coming years. Nationalism, if it endures, may prove to be a bulwark against disaster in Egypt, as the excitement and promise of the revolution gives way to the reality of life in a still-corrupt and increasingly poor country that sits in the most unpredictable region in the world.